The U.S. Energy Information Administration (EIA) has released a free data add-in for Microsoft Excel for Windows that builds on the well-known Federal Reserve Economic Data (FRED) add-in and allows users to find, download, and update EIA's energy data and FRED's economic data directly in any Excel spreadsheet. With this add-in, users can save spreadsheets with their favorite data series and reopen them at any time and update the data with a single click. This ability to easily access the latest available data will save time and effort for analysts performing periodic analyses of energy and economic data. The tool mirrors the functionality of the existing economic-data-only add-in provided by the St. Louis Federal Reserve Bank. Users can browse energy data categories or search keywords to find domestic and international data series, short-term forecasts, and long-term projections. A user guide and installation instructions are available to provide further guidance, along with a short video tutorial. Like several other new data products from EIA, this tool is initially being made available through EIA's beta site in order to solicit feedback and incorporate suggested improvements into the final release. The add-ins from EIA and the St. Louis Federal Reserve Bank are powered by application programming interfaces (APIs), which, along with the add-ins themselves, are offered free of charge as part of each organization's commitment to open data. Throughout EIA's website, the symbol is used to denote a link to a page with the series identifying data (ID) or source key and sample API calls. 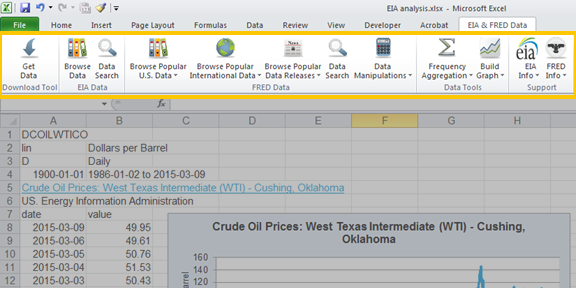 The series ID can be copied and pasted directly into Excel and the series data fetched with the EIA add-in.